Our mission at IWL has expanded over the decades to offer far more than programs designed to advance women’s leadership. With more qualified women on staff than ever before, the business community is now ready to achieve full Gender Partnership – and enjoy the well-documented and sizeable financial and productivity benefits that come with it. Gender Partnership means every member of your team working seamlessly and productively with every other member, regardless of gender. This means men and women learning from each other and leveraging each other’s special skills and talents — no more mixed messages, miscommunication, or hidden bias. Our Diagnostic process provides an exceptional foundation for companies to use Gender Partnership to accelerate women’s leadership and advance business objectives. Our methodology provides a plan for implementing measurable changes and breaking through historic barriers to achieve leading-edge performance. Your custom Diagnostic report will clearly present the major opportunities for your company, the strategic challenges it faces, your areas of excellence, your roadblocks, and specific recommendations that can be used as a prescription for action. 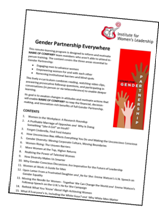 Our Gender Partnership Everywhere e-curriculum combines lively and well-regarded articles and reports from widely admired publications like Harvard Business Review, Fast Company, Scientific American and The Washington Post. It also brings together entertaining and thought-provoking videos from YouTube, U.N. Women, and Google’s own in-house anti-bias program. Participants will gain the knowledge, attitudes, and specific action plans necessary to produce transformative change in their workplace. More information on this in-house workshop. A powerful one-day interactive workshop that opens your team’s eyes to the reality of gender bias and the enormous benefits that accrue, personally and professionally when men and women work together in full Gender Partnership. This program is offered to organizations in-house and can be conducted with dedicated teams or across functions. We will not share your contact information with any other person or company. Ever.